What do we think will happen to the British pound in 2019? Where to start with sterling? Brexit is an all-consuming beast at the moment and will dominate the pound’s performance through the first two quarters of 2019 at least and, depending on the result, further into the future as well. Despite the parliamentary jiggery-pokery of the past month or so we believe that a deal between the UK and EU is signed by the end of the Article 50 period and that a no-deal, cliff edge scenario is avoided. Should we get close to the March 29th deadline we believe political and business pressure to avoid a no-deal scenario will see the government postpone the ending of Article 50 in order to gain more negotiating time. A deal is naturally sterling positive – it eliminates the case of no-deal – but we think that there is the significant chance that the equivalent of a political game of chicken to force weak hands to sign a deal, will drive the pound ever lower in the short-term. Similarly, were the unthinkable to happen and the UK somehow conspires to throw itself over the cliff and onto the rocks then the declines for sterling could be quite staggering. There is, of course, a life beyond Brexit and while sterling would likely react positively to a deal alongside a bounce in investment, growth, consumer spending and the like, we cannot see such an impulse lasting much longer than a couple of quarters. The drivers of such a malaise are very similar to what we will have seen over the course of the Article 50 period – uncertainty over future trading relationships with the EU and other trade partners, mixed economic data and a Bank of England that cannot raise interest rates as it would wish. In the event of a deal we expect sterling to rally to 1.18 against the euro before running back towards 1.14 as the exuberance fades with GBPUSD hitting 1.35 and settling around the 1.30 mark. In the event of a no-deal then we could see declines in GBPEUR to 1.05 with GBPUSD dragged to 1.15. 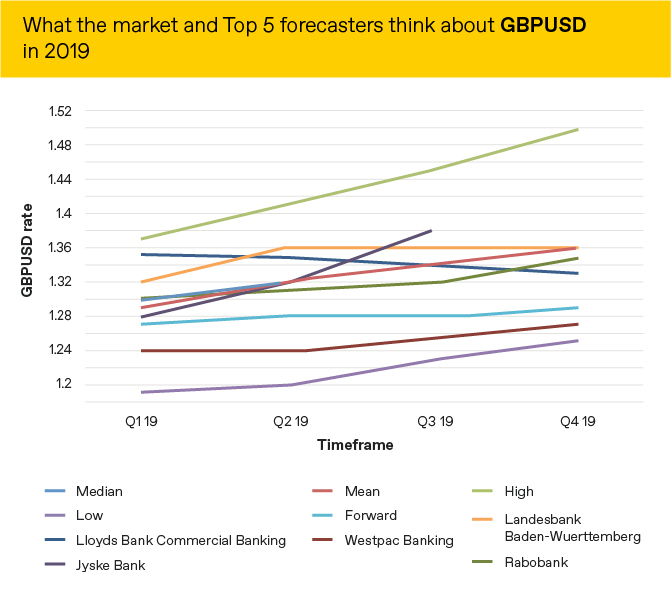 Market expectations of what will happen to the GBP versus the USD are below alongside the predictions of the 5 most accurate forecasters as measured by Bloomberg. The full list of our 2019 currency outlooks can be found here. What do we think will happen to the Swiss franc in 2019? What do we think will happen to the euro in 2019? Jeremy is one of the UK’s leading voices on foreign exchange, and you’ll regularly find him on television and across the national media giving his unique, thoughtful insight. He has made regular appearances on BBC News, BBC Radio 5 Live and Newsnight, as well as in leading blogs and newspapers. Having started out at HSBC in the City of London, Jeremy decided on a move into currency after a brief stint in private equity advice. He joined World First in 2007 as a Corporate Dealer when the Corporate Desk at World First consisted of only five people. He took on the role as World First's Chief Economist in 2010.